Routines. We all have them. 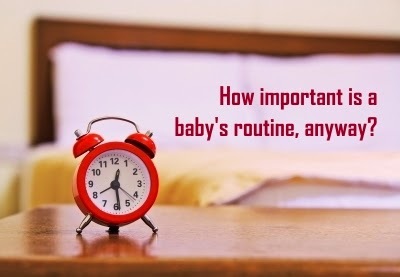 Whether it be routinely getting up, grabbing a coffee, working your 9-5 and coming home again or whether you are locked in a naptime-feedtime cycle with your little one. Routines are the building blocks of our day. When I was pregnant with Ruby I quite liked the idea of a routine. I quite liked thinking that Ruby would sleep and eat when I told her to and that I would single-handedly have the power to ensure I still had my evenings to myself and that my baby would be sleeping through the night from a young age. I read up on Gina Ford's famous wisdom, I did not for one minute think that I would stick to her rigid plans, but I did think I could take the concepts and make them adapt to my own life. But here's the thing, being the super mum that I was (am! ), I also wanted to enjoy breastfeeding and for me, that was breastfeeding on demand. At the end of the day, it was that that won out. Ruby cried, I fed her. Simple. As. That. So any thoughts of routine went out of the window by day three and we happily lived in our feeding, sleeping, demand routine for a year. I loved it. And it taught me something. It taught me that when you're relaxed and not worried about anything, your baby is relaxed. When your baby is absolutely secure in the knowledge that she will receive what she needs when she needs it, she is a happy, secure, independent baby. It taught me to seize the day, live flexibly and not worry about getting home for nap time. I now have a child who will happily sleep anywhere, who is happy to be with other people and who pretty much eats anything. She's well behaved in public and quite happy to sit with me in a coffee shop (seeing as when she demanded breastfeeding, this is where we would routinely stop each day!). Ultimately, she has fallen into her own routine and it happily fits in around my routine. She goes to sleep at 8pm and wakes up at 7am. She eats lunch between 12 and 1pm, and she eats dinner between 5 and 6pm. She has breakfast between 8 and 9am. She's now down to one nap in the day at about 2pm, but if we miss it she'll sleep at 3. The only rule is that she cannot sleep beyond 4pm. I have enough stress in my life without having to worry whether she's sleeping at the right time or eating at the right time. We live busy lives, we're out every day and each day varies. I am so glad that I don't have to be home by a certain time because my child will only nap in her own cot. It does mean that she only really naps in her buggy, but that's ok, because it means I can go out, and hopefully it will be relatively easy to phase out the naps when we're ready (just phase out the buggy as she is a super walker!). Right now, we've happily slotted in to each other's routines rather than me having to sacrifice my entire life in order for Ruby to build hers. I'm sure things will change when we have another child, because we'll be throwing a third routine into the mix and school commitments will ensure we are up and out early. But for now, we're happy with our routinely flexible, worry-free living. Today I'm lucky enough to be featured over at The L's Mum, chatting about my baby routine. Hop on over there and take a look! You seem to have the balance between routine and flexibility just right - Happy days !